GLOWING SKIN ON THE GO…perfect to throw in the honeymoon suitcase! Getting a bombshell blowout, a deep tissue massage and a relaxing facial not only make us feel better, but it makes us look better. However in this economy my bank account won’t let me get everything done on a regular basis, so what’s even better than a facial at the salon for glowing skin? A free facial at home of course! 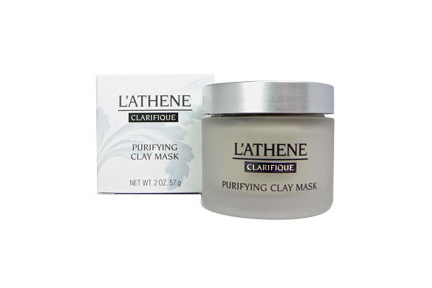 On Saturday evening as I was getting ready to go out I decided to try L’Athene’s Purifying Clay Mask. It has been created by skin care consultants and Registered Nurses and contains peppermint, tea tree and clove oils with witch hazel and mineral clay to help your skin have a deep-cleansing, pore-fining mask that refreshes skin, helps prevent blemishes, and makes your skin feel and look young and rejuvenated once again. I was in a rush so I wore the mask and then popped in the shower to get ready. I had the mask on for fifteen minutes and during that time the clay didn’t make my skin feel to tight or dry, but instead it felt cool and moisturizing. It also filled the bathroom with the aroma of peppermint and tea tree oil and helped me relax. As I washed of the mask with the warm water, my skin felt fresh and clean. There was no redness, irritation, or dry skin. Instead, I threw on my sunscreen and put on my make up and let my skin glow. Visit L’Athene’s Web site for more information. Blog post by Style Media Group’s Executive Editor Desiree Patterson.